Being able to deliver outstanding customer service will be greatly appreciated by the customer. Not only does it bring back trust to your business, it also strengthens it. However, providing an unforgettable experience to your customers can be a constant struggle. This is why a lot of businesses put a great effort into this area of their business. To ensure that you do provide great customer service to your customers, you have to make sure that you are making use of the right tools. One of the simplest tools that can help you out is having a quality checklist that would have all the necessary items that talk about how your customer service representatives will be able to provide professional, polished, and quality customer service that would help make the customer experience of your business in top-notch form. 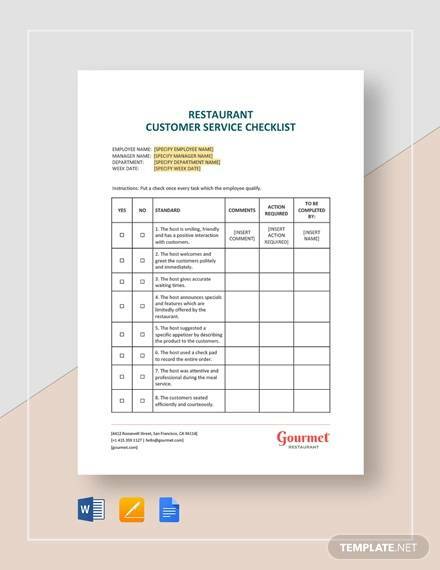 The checklist that you will be using can help ensure that everyone in the customer service team is doing their assigned task and that they are meeting the target and are delivering according to the values that the business abides with. With the checklist, you will also be able to monitor the strengths and weaknesses that you currently have and be able to make the necessary corrections. Employees will be more knowledgeable of the procedures. Every business has standards that need to be met. This is especially true for those employees who are part of the operational team as they should know what tasks need to be completed and how they can be executed properly. You have to remember that no matter how big or small tasks may be, they are still considered to be a vital part that makes the business run smoothly and can actually help make the customer service experience a pleasant one. With a checklist, you will be able to make sure that everything—small and big tasks alike—have been given the same amount of attention. The completion of each and every task is great at making the experience a positive one for the customers. Efficiently fix issues. With the help of checklists, you will be able to pinpoint issues much easier. Even the most minute of all issues must be resolved in order to avoid any more issues that might turn into bigger issues. With checklists, the members of the team can easily discuss and collaborate ideas to make sure that every single issue is tackled accordingly. Monitor inventory. The customer service checklist will also serve as an inventory checklist. This way, you will be able to properly monitor which stocks are running low and which ones are almost expired. If your stocks are in check, you can decrease the chances of your customer leaving disappointed because you will be able to satisfy their needs properly. Motivate employees better. Checklists will make your employees’ work way easier since it will be a guide to what they need to do and what they need to be done. It will also be a way for you to check which areas the employees excel in and which areas need a little more work. It can also be the basis for your employee incentives. You can check more on How to Evaluate an Employee’s Performance to get more ideas on how you can evaluate the employee’s performance. Typically, customer service checklists would be broken down into two parts: one for ensuring that quality is in check during the opening and another for when closing one as well. To make sure that everything is in check, read the following tips that we have. Understand the customer’s query. Active listening would play a big role in making sure that you know what you will advise the customer and it also ensures that you will not be wasting anyone’s time. Do not pretend that everything is clear if it is not. Do not be afraid to ask the customer any areas of his/her query/queries that you do not understand or seems unclear. If you properly understand what your customer is asking, then you will be 100% sure with your response to the customer. Know the products they want. If you know what they want, then you would be able to properly suggest which ones are appropriate in case the products they want are not available. Always match your suggestion with what the customer needs at the moment. Review your response. Especially if you are responding to customer queries through messages. Match your tone accordingly with the customer’s personality and make sure that your answer is clear and can be easily understood. Let your team in on your response. Whenever given a chance to have team huddles, it would be a good idea to discuss the problems that you have encountered and how you resolved them. This way, the team would be able to think of ways on how to tackle problems in a more effective and efficient manner that would make the customer’s experience satisfactory. Answer follow-up questions before they ask. Typically, you will encounter problems that would most certainly have follow-up questions. Do not wait for the customer to ask the follow-up question. Instead, ask it first and should they confirm that they would also like to ask for the follow-up, answer the question accordingly. This gives the impression that you put your customers first and that you know how to make your customers satisfied and happy. Make sure they leave with a smile. That smile will make the difference. Let them know that they can get in touch with you anytime they want and that you would always be willing to go the extra mile for them. When you want to improve customer service, remember that it all starts with good business operations. 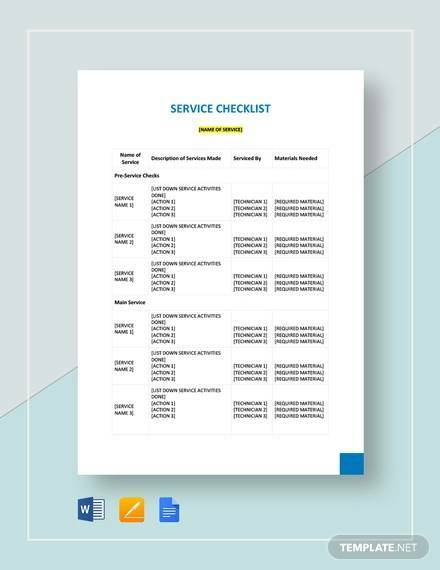 The checklists are meant to boost efficiency and reduce mistakes and are great guides for your customer service team. With checklists, your teams will be equipped with the right tools and the right knowledge to complete all operational procedures quickly and efficiently. 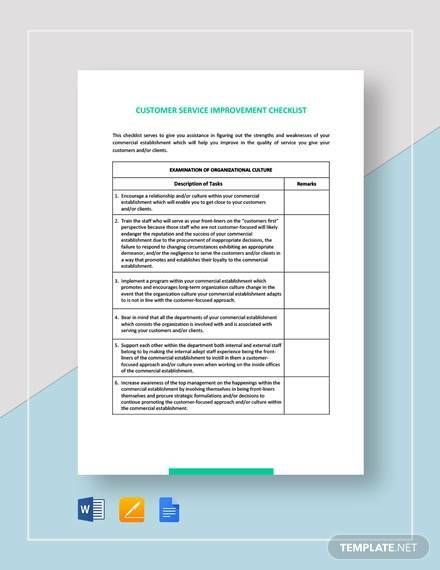 You can check out some of our sample checklists to gain a better perspective about how you should go about your customer service checklist.